SKU: WX-OVOM-PEBA. Categories: Adrenal Support, Antioxidant, Athletic Boost, Brain Support, Energy Boost, Extracts, Liver, Longevity, Men's Health, Mood, Thyroid, Women's Health. Tags: Adrenal Fatigue, agility, Anti-inflammatory, antioidant, Anxiety Disorders, athletic performance, ATP production, autoimmunity, autophagy, Brain Fog, Chronic Fatigue, concerntration, cortisol balance, digestive disorders, endocrine system, energy, energy boost, estrogen, fertility, FIBROMYALGIA, focus, hormonal balance, hormonal health, immune boost, immune system, inflammation, kidney function, Kidney Health, Kidney Support, liver health, Low energy, memory, mental energy, metabolism, mitochondrial health, mood, Neurological disorders, Obesity, physical energy, reproductive function, strength, stress, testosterone, thyroid health, vitality, weight loss, weight management. For strong ATP and mitochondrial support that gives this formula its primary energy punch. 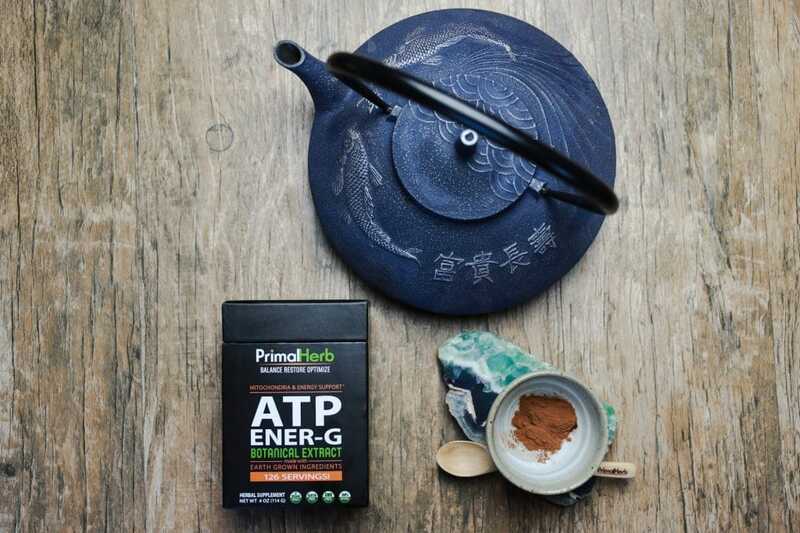 Cordyceps boasts the strongest research for ATP-boosting abilities, so we had to include it as ATP ENER-G’s principal actor. Eleuthero comes in next as ATP ENER-G’s second-in-command re-energizer. While research hasn’t yet established a solid connection between this ginseng-like herb and ATP activation, it nonetheless has a reputation for stellar research on its ability to pull up energy by its bootstraps. Eleuthero and cordyceps will help pump up physical energy, while cistanche makes sure that mental energy levels are running high as well. If forgetfulness, brain fog, difficulty concentrating, and even mood imbalance are all connected to low energy issues, this desert adaptogen can give the body a pick-me-up. Finally, we include green tea extract because of its rich catechin content. Even better, we ensure that the most powerful, well-studied catechin is extracted into the blend for the best energy revitalization of all: epigallocathecin gallate, or EGCg. Great product! Packaging issue fixed! Great product! I am super happy that primal herbs fixed the packaging issue with a decent resealable bag. Great product! Good quality! Will definitely buy again! I haven’t been taking ATP for very long so I have no opinion at this time. Hoping to achieve a more energized day. Everyone can benefit from more positive energy!! Absolutely love the energizing benefits of ATP EnerG!! I’m 64 and keep busy on a small homestead!! I add ATP to my morning smoothy . I don’t ink coffee but this is very different from a caffeine boost. It’s subtle but effective! No crash. I’m also noticing more mental clarity and positive well being!! Great for energy with no bitter after taste. I tried this product because I suffer with chronic fatigue and didn’t want a product with jittery stimulants. This product dissolved well and is easy to use. 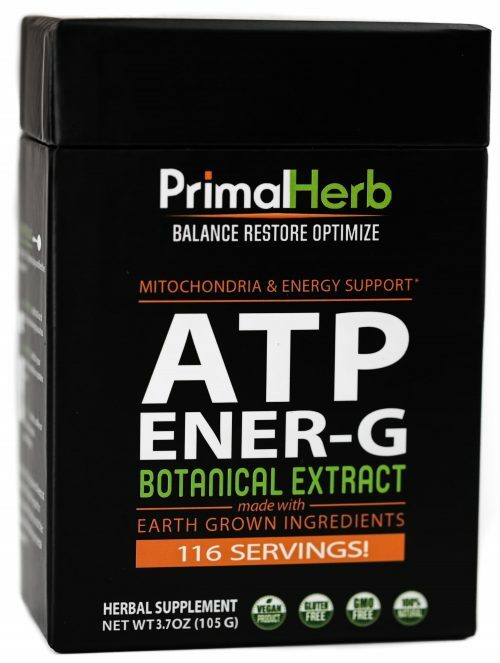 ENERGY AND ATP SYNTHESIS SUPPORT – NO MATTER HOW YOU MIX IT! Having low energy is one thing. Getting back into an energizing routine—when there’s no energy, to begin with to get the ball rolling again—is another struggle altogether. We’ve heard it all: just exercise, eat better, work less, play more. But sometimes, that just isn’t enough to get us out of the rut we’re in. Not to mention, we might not have all the above options available to us, either. Some of us are tied to intense 9-to-5 schedules or ambitious agendas that tap us of all our energy. Either way, it’s hard to take the time out for re-energizing self-care. But with the help of herbs, taking that first step towards better energy could be much easier and more convenient—and all because herbs can help give us some energy back in the first place. The reasons why we experience low energy can be many. Issues like adrenal fatigue, low immunity, stress or depression, anxiety, and countless other problems all contribute to sluggishness, mental apathy, and brain fog. But the way we each create, store, and use (or lose) energy is actually the same, at the very foundation of it all. It doesn’t matter if we’re simply experiencing burnout or struggling with a major imbalance or disease, such as fibromyalgia or autoimmunity. What energy usage and storage all comes down to: DNA and mitochondria. Both live in each and every one of our cells, and are instrumental to releasing practically 90% of the energy we release: 15 times more than what is released from blood sugar processing in our blood alone, according to Molecular Biology of the Cell in 2002. This means that, in addition to a more energetic lifestyle and diet, there is something much deeper down we need to take care of beyond all this—and a whole other level of health we must focus on to get our energy back. And for many imbalances—whether thyroid, autoimmune, metabolic, or other—the source for low energy may end up being due to the very same thing: damage inflicted on our DNA. To understand energy and where it comes from, we need a bit of basic science. First off: mitochondria are basically organelles found within each of our cells. Each of them contain and create DNA. They’re also responsible for a huge portion of energy synthesis through transporting and creating ATP (short for adenosine triphosphate). It’s through our DNA and ATP that most of our energy is released. And yet, if this microscopic part of our body begins to struggle, low energy can be a problem that follows. And what is the greatest threat to our DNA? Free radical damage—a process resulting from chronic inflammation caused by poor diet, illnesses, and much more. Not coincidentally, a lot of illnesses commonly paired with low energy (like chronic fatigue, fibromyalgia, autoimmune illnesses, extreme stress, and more) all have that in common: they involve chronic inflammation, which harms DNA. And when DNA is at risk, so are our energy levels. Getting energy back can involve managing our illnesses better, and by not letting stress run our lives. Eating antioxidant-rich foods high in vitamin A and C can be a boost to us too. As it has been stated time and time again: eating better, cutting out harmful foods and substances, and exercising more are all ways to do this. It’s always recommended to do this when facing any health issue, but it can be incredibly hard to get started changing our lifestyles so profoundly. That’s why, beyond all this, we can call on extra help from incredibly antioxidant-rich, adaptogenic botanicals if (and when) we find ourselves needing it when our tanks are completely empty. Traditional cultures have turned to the use of herbs and fungi to restore low energy due to all sorts of imbalances for thousands of years. Today, science and research support many of these—and we’ve picked the most well-researched, time-tested herbs to put in our own energy-boosting formula. Among herbs renowned for boosting energy, eleuthero doesn’t trail too far behind the previous. Just like cordyceps, it is also a well-known protective adaptogen that boosts energy, increases endurance, improves physical well-being, and even reduces tiredness. For those suffering from low energy resulting from any sort of imbalance or illness, eleuthero can help, especially where work and physical demand is concerned. A 2010 eight-week long study demonstrated that eleuthero could indeed boost energy, improve metabolism, and also helped people sustain energy levels for longer than usual. Just like with cordyceps, it is supposed that these effects are due to its very antioxidant, free radical-protectant nature as an adaptogen. A lesser-known adaptogen from the Asian continent, cistanche is nevertheless a powerful, provocative herb that has garnered quite a bit of attention in recent years. While it does draw some similarities to eleuthero and cordyceps in terms of energy-boosting, it does seem to have a bit of a different focus: it boosts energy in the mind. A very recent 2016 review showed that fatigued mice, with the help of cistanche, could learn quicker, forget less, and navigate much more rapidly through complex issues than those who didn’t take cistanche. Some of these mice even out-performed those that took a pharmaceutical mental energy booster! Of note too: cistanche was listed as one of many yang tonic herbs known to enhance mitochondrial ATP energy creation in a 2011 research article. We know that lack of physical energy can really tap us out. But for those of us who can attest to mental fatigue, cistanche may be just the perfect herb for the problem. Cordyceps is a unique fungus that grows not from the ground, or even from a tree—but from live insects! This has won the mushroom the name “caterpillar fungus.” In Asia, it was revered as a sacred medicine for restoring health, and the strangeness of how it grows certainly shrouded it in mystery. Such a reputation has drawn a lot of scientific research to it, exploring what (and how) exactly cordyceps could make people so healthy. As it turns out, its biggest claim to fame is helping bolster the body’s energy stores. 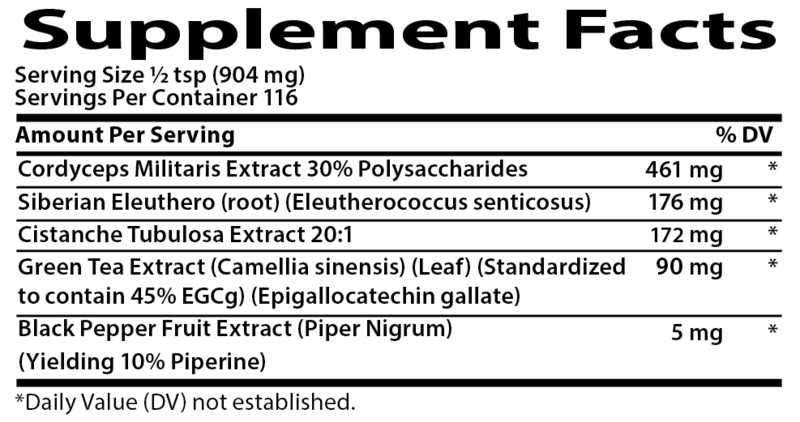 No doubt it accomplishes this as an antioxidant adaptogen that acts on metabolism. A recent 2012 study found that the polysaccharides from cordyceps mycelium (like that found in our formula) helps reduce the chacnes of fatigue and raise energy in mice. Another study only 2 years earlier found that older subjects had much better energy levels taking cordyceps than if they had just taken a placebo. Perhaps most directly of all, a 2015 research article directly connected cordyceps to increased production of ATP in the body. No matter the cause for low energy, cordyceps is a top choice among all botanicals to cut straight to the core of fatigue and sluggishness issues. For those hungering for an antioxidant-rich herbal supplement in their lives, green tea has long been a popular standby. There are plentiful studies demonstrating that this beverage—one of the world’s most popular beverages of all time—is a highly protective antioxidant that can also get metabolism running powerfully again. Studies have shown that green tea’s catechins (antioxidant phenols) also have stimulating effects on energy in the body. A 2010 review of green tea research found that catechins have a way of revving up metabolism—which doesn’t just increase energy levels, but also encourages the body to lose fat and maintain a normal, healthy weight. 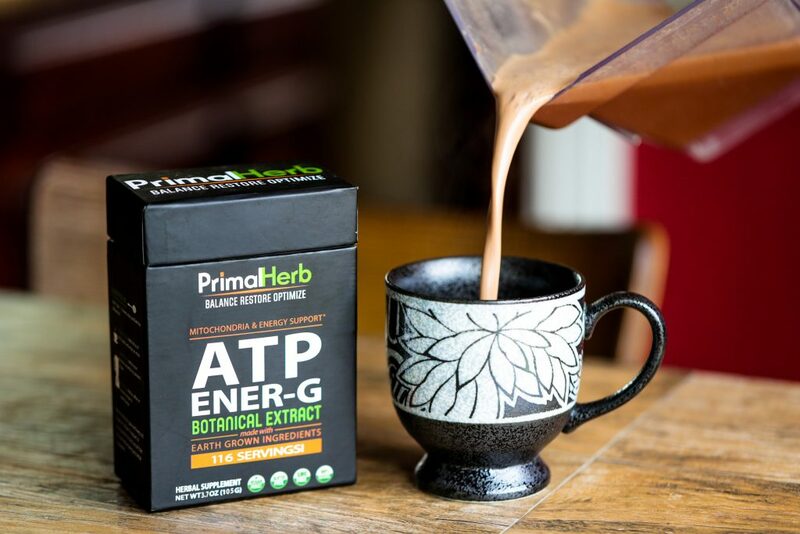 At Primal Herb, our ATP ENER-G formula brings the varied powers of energy-boosting, ATP-supporting herbs all together to raise energy levels in one fell swoop. Breathe energy and life back into the daily routine, and get the energy kick needed to restart a more energetic lifestyle. Let these herbs conveniently replenish energy through ATP and mitochondrial function, when there otherwise wouldn’t be the time to! ATP ENER-G can be taken day or night – with or without food, so enjoy! This product works if you follow instructions. Feel great since I started this one. I can tell a difference after just taking this for two days. More energy, more clarity. I get really tired in the afternoon each day and this has helped a lot the last two days.